The Urban Politico: The Invitation: Is the Right Wing Using Common Sense? The Invitation: Is the Right Wing Using Common Sense? Sounds like part of a "life story" speech you would hear at a 'Pro-Life' Tea Party rally huh? Nope, it is from a song called Retrospective for Life by Common, who the right wing, and their most recent faux outrage, would have you believe is a "vile," "cop killing," "radical extremist," "gangsta rapper!" Common, a socially conscious, Chi-town rapper/actor, was invited to the White House to participate in their annual poetry nights. Normally this is a non-issue. However, this year, the right wing spin machine decided to turn Common into a "gangster" and this non-issue into a full blown controversy. Complete with dedicated time on both Hannity's and O'Rielly's show, right wing radio, and of course, a tweet from Sarah Palin - because no right wing conspiracy is complete without a tweet from Sarah Palin. What did Common do to draw the ire of the right wing? Well, it starts in 1973 with a young lady by the name of Joanne Chesimard AKA Assata Shakur (uh oh... another 'funny sounding name' - she must be from the country of Hawaii). You see, Shakur, the step-aunt of Tupac Shakur, was a member of the Black Liberation Army who was wanted for her involvement in several felonies including bank robbery. On May 2, 1973, Shakur was stopped for a motor vehicle violation on the New Jersey Turnpike by two State Troopers. The traffic stop turned into a shootout; a State Trooper was shot and killed and Shakur was wounded. In 1977, Shakur was found guilty of first degree murder, assault and battery of a police officer, assault with a dangerous weapon, assault with intent to kill, illegal possession of a weapon, and armed robbery, and was sentenced to life in prison. In November 1979, she escaped from prison and now lives in Cuba. Of course there is controversy in this case. From one of the witnessing Troopers lying, then recanting his testimony, jury issues, and medical and forensic evidence to the contrary, the case and guilty verdict against Shakur has always been one of question. Especially in the black community where the shooting of a surrendering black person and subsequent questionable conviction by an all white jury in 1973 requires little suspension of belief. Common, as did many in the hip hop community and believing Shakur was convicted of a crime she didn't commit, celebrated Shakur in a song entitled A Song for Assata. Because of his 'support' of Shakur, the right wing is taking our conversation about the good and bad in art a step further by saying Common's invitation to the White House is President Obama supporting "cop killing." Now we see that same question on a national stage: "Is an invitation to the White House an endorsement of an artist’s entire oeuvre, of a person’s whole being?" The song speaks on the direction that hip hop music was taking during the late 1980s and early 1990s. It specifically refers to the fall of conscious and Afrocentric rap; as well as the rising popularity of West Coast hip hop and G-funk. In the song, Common makes an analogy comparing the degradation of a woman with the deterioration of hip hop music after its commercial success forced it into the mainstream. This criticism ignited a feud with West Coast rapper Ice Cube, and helped fuel the growing animosity towards the West Coast hip hop scene during the early stages of the East Coast-West Coast rivalry despite Common hailing from the Mid-West. Common's stand AGAINST "ganagsta rap" put him at odds with one of the biggest - and arguably - a pioneer of modern day rap. To me, this is becoming an all too common theme. As Black people, we aren't afforded the opportunity to represent ourselves. Instead, we carry the weight of the entire Black population - like it or not. As a result, a "conscious" rapper, known, by those who care to know, as one who has a positive message on several issues - from community violence and women in rap, to politics - is erroneously forced into a category that an ignorant crowd labels any and all rappers, "gangsta." It's easy for the right wing to label Common as such in an attempt to besmirch the name of President and Mrs. Obama, because they know their constituents won't and don't care to challenge them. "Common raps? Well he must be a 'gangster.'" Common's "real" crime? He has an Afro-centric message. He is from Chicago and attends Trinity United Church of Christ whose Christian message through black liberation theology is delivered by Rev. Jeremiah Wright (yes, THAT Jeremiah Wright). So instead of seeing a young man who inspires leadership in the black community, and on many different stages in life, represents a positive role model to many; they see a black, radical gangster. Is it any coincidence that those EXACT words have been used to describe President Obama? I guess they feel they can use Common as illustration and force the negative image many White folks have about hip hop and rap onto the president. Who knows... Since they couldn't prove that he was a foreigner, and don't seem to be that successful in undermining President Obama's recent successes, maybe this is a further attempt to remind everyone that Barack HUSSEIN Obama is actually a black man... a hip hopper... just... "different" from "real Americans"... "look, he even invites his radical gangsta rapper friends to the White House!" ﻿To be clear, Common - who's written children's books, is a vegan, champions for animal right's and PETA, and supports HIV/AIDS awareness (Editors Note: on the heals of our Homophobia and Hip Hop post, it would be wrong of me not to mention that Common is one of the only rappers to publicly pledge to stop using anti-gay lyrics in his music.) - is far from "gangsta." Further more, those with ANY common sense - pun intended - know that Common will NEVER be as "gangsta" as others who have visited the White House. 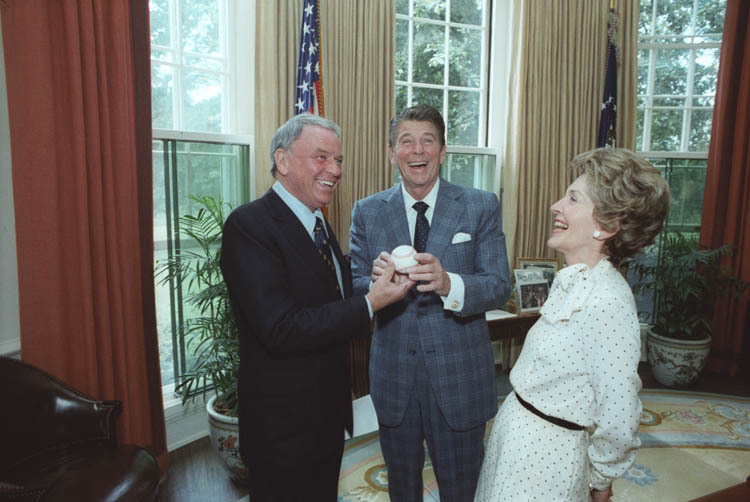 Frank Sinatra visited the hero of the current right wing movement, Ronald Reagan, at the White House on several occasions. 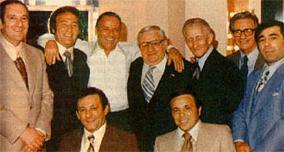 As my blog partner Shady said, "When someone has a pic like [the one below] of Common [posing with REAL gangsters] then I might pay attention to morons claiming he's gangsta. Until then, they need to STFU!" Oh... Just in case you wanted to know if Common spread his "radical" message in the White House, take a listen and decide for yourself. Is this a legitimate issue presented by the right wing? Or are is this just a new attempt to devalue the president? Knowing the current perception of hip hop and rap music, should President and Mrs. Obama invite a rapper to the White House? Is this another "controversy" that is laced with racism?